The Periodic Table is a summary sheet based on data collected from our research on SRD, ISR, and AE metrics and compensation. The reports are the result of surveys with 384 B2B technology companies. Knowing that executives often prefer the short version we thought a metrics cheat sheet would be helpful. 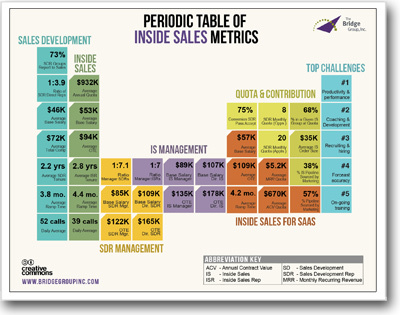 Periodic Table of Inside Sales Metrics by The Bridge Group is licensed under a Creative Commons Attribution-Noncommercial-Share Alike 3.0 United States License. Based on a work at www.bridgegroupinc.com. Awarded ‘Top 20 Women to Watch in Sales Lead Management’ by SLMA. Consultant, speaker, trainer, and sales mentor.